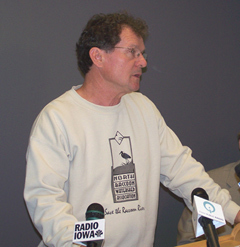 An environmental group issued a report today showing industrial facilities dumped 3.5 million pounds of toxic chemicals into Iowa waterways in 2007. Eric Nost, with Environment Iowa, is calling on the businesses to switch from using hazardous chemicals to safer substitutes. The report identifies Tyson Fresh Meats plants in Columbus Junction and Perry as two of the top polluters. A spokesperson for Tyson calls the report “misleading” and says they release wastewater into streams and rivers only after it has been fully treated in accordance with state requirements. The plant released over 1.38 million pounds of toxic chemical waste into the Iowa and Cedar Rivers, according to the Environmental Protection Agency. 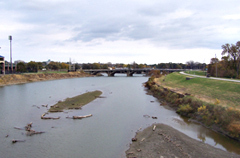 The Raccoon River, which runs through Des Moines, supplies drinking water to nearly one-fifth of Iowa’s population. Racoon River in Des Moines. Other facilities that are identified in the report as the top contributors to pollution in Iowa waterways include Cargill in Ottumwa, Pinnacle Foods in Fort Madison, Monsanto in Muscatine and Cambrex in Charles City. Delaney says while the industrial facilities are part of the problem, he’s more concerned with the nitrogen and manure spread on farm fields that’s getting into waterways. “This report focuses upon point sources, which is a problem, there’s a bigger problem. That has to do with non-point sources…what’s coming off of farm tiles and running off the land,” Delaney said. He believes many livestock operations lack oversight from the EPA and state regulators.